A broad coalition of trade unions, student organisations and other campaigners held a “clean-in” demonstration at the University of Nottingham (UoN) yesterday morning, calling on the new Vice Chancellor, Shearer West, to “do the right thing” and commit the university to paying all its staff, including cleaners and other low paid workers, the Living Wage. Nottingham University Living Wage Campaign (NULWC) member and college lecturers’ UCU union UoN Vice President Andreas Bieler delivered a letter on behalf of the campaign, made up of university cleaners, students, academics, the UCU, Unison and Unite unions and Nottingham Citizens, asking her to spend a day with the cleaners and to discuss the university becoming an accredited Living Wage employer. Prof. Bieler said the world-class, Russell Group university should make “a long-term commitment to paying all of its staff a wage they can live on, a wage that they can feed their families on and a wage they can work on with dignity”. The so-called “real” Living Wage (as opposed to the lower, statutory National Living Wage rate) is an hourly rate set independently and updated annually each November by the Living Wage Foundation. It is calculated according to the basic cost of living in the UK and is the minimum that employees need to get by. The NULWC estimates that several hundred university employees are struggling to live on pay levels below the current Living Wage rate of £8.75 an hour (outside London) – equivalent to a full-time salary of around £17,000 a year. According to one cleaner’s testimony read out at the demonstration this morning: “My wages here just cover my council tax and rent. I’m paid on Thursdays at the end of the month, by Saturday I am already overdrawn again. I cut down on all bills as much as possible, I use the car only to go to work, all my expenses have to be tightly calculated. I depend on bargains when shopping for clothes and food, things on half-price, the sales. I don’t go out, I simply can’t afford to go out. 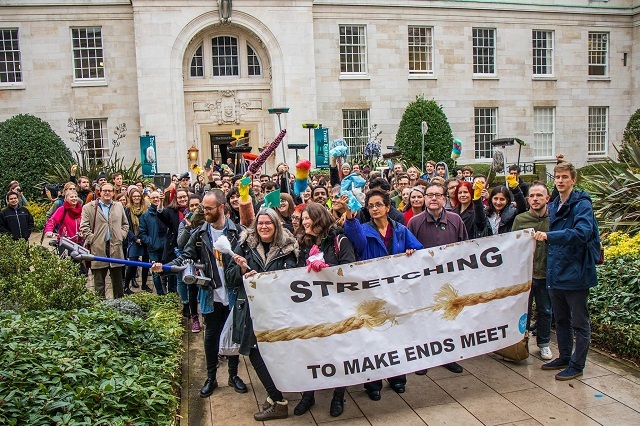 The campaign estimates that the cost to the university of raising the pay of all staff to at least £8.75 an hour would be around £1 million in the current financial year – less than six per cent of its £18 million surplus in 2016 and around 0.3% of its total spend on staffing of £324 million in 2016. Students have consistently voted in favour of the university becoming an accredited Living Wage employer. Thanking the people “who get up at 5am to clean our lecture theatres and are on to their second jobs before we even wake up”, Nottingham Students Union Community Officer Ellie Mitchell made clear that students care more about staff being treated and paid properly than expensive buildings and being top of the league tables. “What we really care about is the people that make our experience here great,” she said. Nottingham Citizens Community Organiser Pete Rogers explained that today’s action is the first public step in a long-running Living Wage campaign at the university. Citizens UK began the campaign for a Living Wage in London in 2001. There are now more than 3,500 Living Wage employers across the UK including, in the higher education (HE) sector, the London School of Economics, University of Oxford and University of Glasgow. Locally, employers including Nottinghamshire Fire and Rescue Service, the Police and Crime Commissioner and Five Leaves Bookshop are committed to paying the Living Wage to all their staff. However, the Living Wage Foundation reported earlier this month that one in five people (21 percent) in the UK are still earning below the real Living Wage, meaning that that an estimated 5.5 million employees are struggling to get out of in-work poverty. Although this year the number fell for the first time in five years, it still leaves the total a million higher than in 2012. In addition, 62% of those earning less than the real Living Wage are women and nearly one in three of all working women do not earn a wage they can live on, according to the Foundation. Campaigners believe that signing up a large and prestigious organisation like the University of Nottingham as an accredited employer could be hugely influential in promoting the Living Wage across both Nottinghamshire and the HE sector. Andrea Oates is an NUJ freelance journalist based in Beeston, Nottinghamshire.